The second hull in the Amer Cento series has been launched by Italian yard Permare. 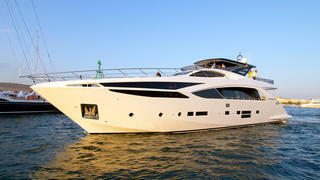 Built on spec measuring 29.6 metres LOA, Amer Cento Quad is the follow-up to the 2013 launch Lady Liudmila. This all-GRP fast-planing yacht features naval architecture and exterior design by Massimo Verme, while the interiors are courtesy of the in-house Permare design team. Accommodation is for ten guests split across a full beam main deck master cabin and four equally sized cabins below decks; two doubles and two twins. The crew quarters allows for a staff of up to four people. The main-deck saloon features two L-shaped sofas and a separate dining area, which provides seating for six around a large dining table. Permare has fitted out Amer Cento Quad with vintage Javan teak flooring for the interior and cork decks for the exterior, which help to lower the centre of gravity and reduce the weight of the 60 square metre sundeck by one tonne. Key features include a superyacht spa pool on the flybridge and a hardtop bimini, which provides shade for the upper helm station and surrounding seating. 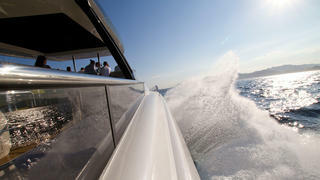 Power comes from four Volvo Penta IPS pod drives, which propel Amer Cento Quad to her top speed of 29 knots. The hull is designed around a fast cruising speed of 23.5 knots, and acceleration from 6-26 knots is achieved in just seven seconds. Other projects under development at the San Remo yard include the first model in the 33.5 metre Amer 110 series, which is currently under construction ahead of a planned 2017 launch.